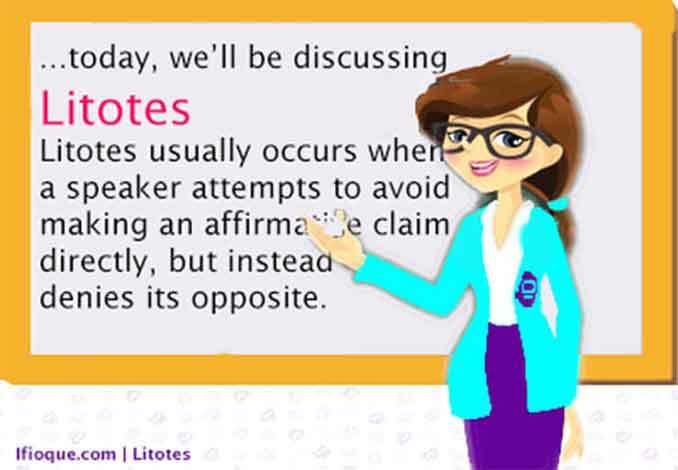 Litotes usually occurs when a speaker attempts to avoid making an affirmative claim directly, but instead denies its opposite. Litotes (etymologically derives from the Greek word “litos,” literally means “plain,” “small,” or “meagre”) is a figure of speechOpens in new window that uses understatementOpens in new window to emphasize a point, of which an affirmationOpens in new window is expressed by the negative of the opposite, thereby amounting to a double negativeOpens in new window. Litotes usually occurs when a speaker attempts to avoid making an affirmative claim directly, but instead denies its opposite. As in: ‘A citizen of no mean city’. In litotes two negatives do not just cancel out, nor do they merely make a positive, but effectively make a strong positive. You are no ordinary girl. You are ordinary girl. You’re not wrong, that’s not a good idea. You are wrong, that’s a bad idea. She is not as young as she was. She is old. It's not my first major project.. I am experienced. This is no trivial issue. This is a serious issue. “A physician being mentioned who had lost his practice, because his whimsically changing his religion had made people distrustful of him, I maintained that this was unreasonable, as religion is unconnected with medical skill. Litotes significantly adds elegance, variety and rhetoric effect in which case it understates a serious situation, by making it seem less important than it really is; a vital means of achieving this is the use of double negatives. This device emphasize a point without wounding humane feelings. Litotes is a stylistic device originated from Ancient English poetry; it is wildly used in present time literature and in contemporary conversations.